It's easy to envy the primary teachers who get to dive deep into the joys of the seasons with their students. Who doesn't fondly remember making applesauce with their teacher, dressing up for the school Halloween parade or carnival, and coming home with CANDY on October 31st? I still remember the year I dressed up as a dollar bill for school. It was amazing. Just saying. Anyway, I like to try to build in a little holiday time with older students too. It's just another way to learn from the amazing things our primary teachers are doing. Ahem, classroom libraries and beautiful spaces, ahem. I have been so inspired this year by Angela Stockman's work with bringing the maker movement into our English classrooms. She shared such a compelling message with me on the podcast (episode 047) about how to use the making process to inspire reluctant writers, spur more critical thinking and creativity, and help overwhelmed students avoid writer's block. So I decided to try my hand at creating a Halloween Maker Lab for you. 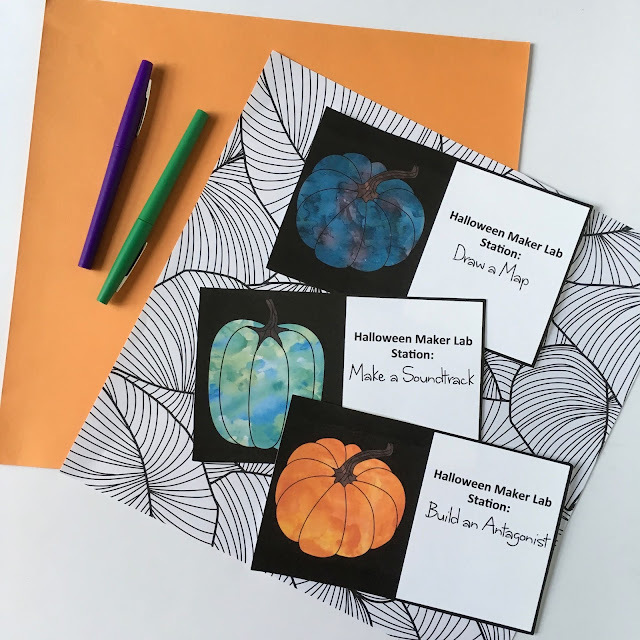 I think you're going to love how flexible and fun this activity is for your students (and that it's a free download you can snag today at the end of this post!). 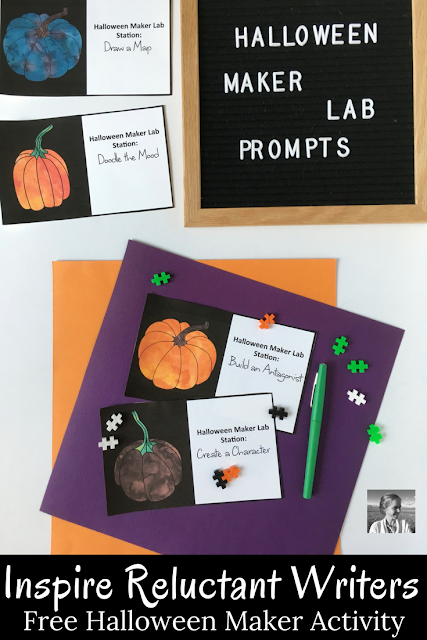 The basic premise for this creative activity is that students will create the elements inside of their Halloween creative writing BEFORE they begin writing. 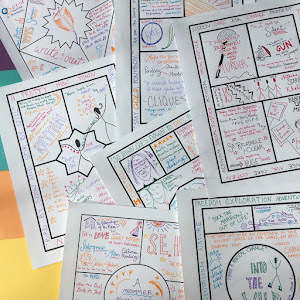 By doodling, drawing, constructing and creating, they will brainstorm all their moving literary pieces, and that will make it so much easier to write. When they pick up the pen (or power up the iPad) they will already have a vision. And that, my friend, makes a huge difference. You can use these stations however you wish. Choose a few or choose them all. Let students go to only the ones they find helpful, or ask them to try out every single one you put out. Have students drift freely, or give them a set time at each station and then have them rotate in groups. 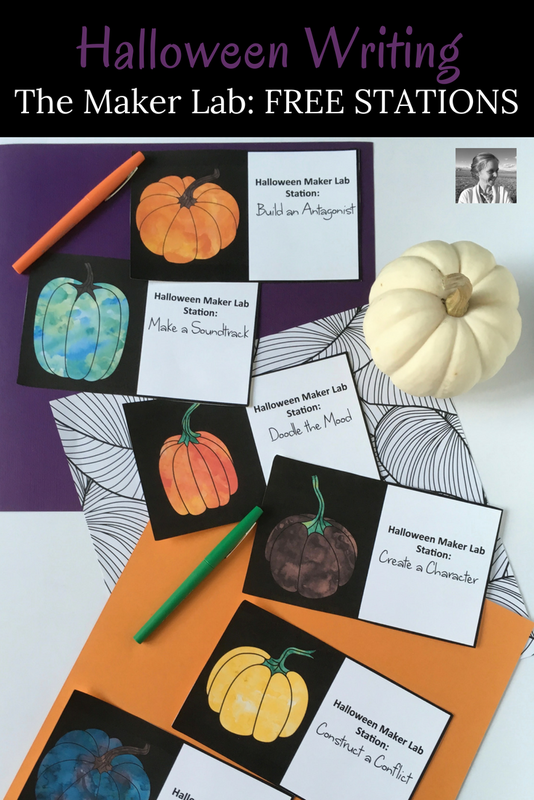 Simply cut out the station cards, set up groups of desks or tables in your room, and put out whatever maker materials you can come up with. Pen and paper works. Legos, playdoh, paints, pencils, flair pens, recycled materials do too. Whatever! 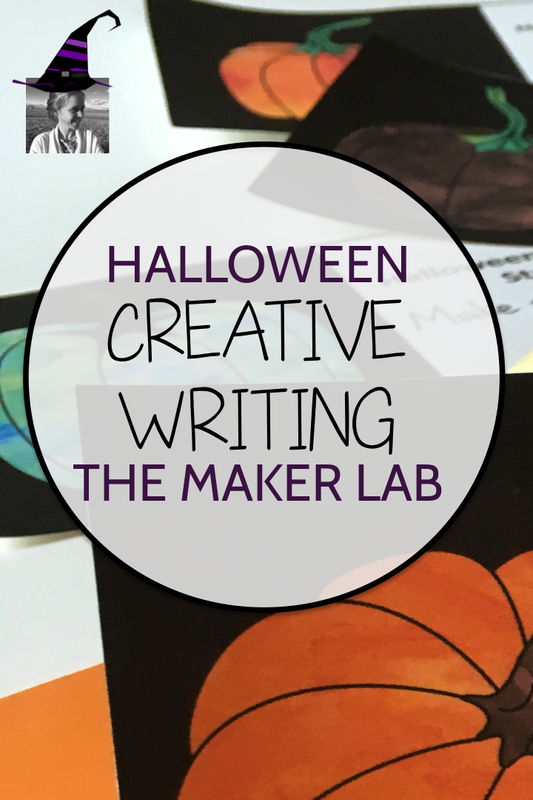 Then invite the students to "make" the elements of their creative Halloween writing. Let them know they will be using for a creative Halloween writing project. Once students have made the various elements, invite them to use what they’ve made to help them create a Halloween-themed short story, prepare a dramatic scary story to tell the class, write a series of Halloween poems, or even write a Halloween play or screenplay. Or let them choose what really suits them from all those options. This is soooooo flexible. 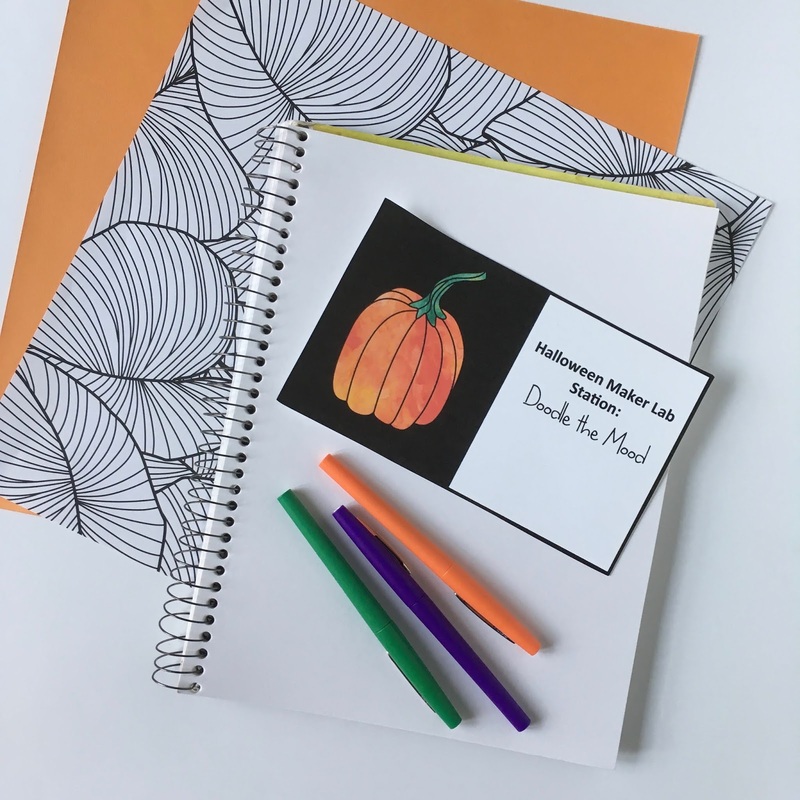 You can do a different station every few days throughout October, then do the writing project at the end. You can do all the stations in one day, then have students work on their writing for the next few and finish with a gallery display of the maker pieces and the final written work. You can do a week's worth of stations as bell ringers, then spend the next week in writing workshop. The point, in the end, is to find joy in the creative process, to learn how to #makewriting, and to produce a wonderful written piece! Ready for action? Grab this set of stations by signing up for my e-mail list below. You'll get your free download as soon as you confirm your address, and you'll also be joining 6,000+ other teachers in receiving creative teaching ideas and updates on new posts and podcasts from me on Fridays. Whoo hoo! Got Reluctant Readers? There's Help.